Troubled hotel handyman Jason (Randolph Roberts) dons a creepy mask and dispatches beautiful blonde women in the 1973 slasher flick Wicked, Wicked. 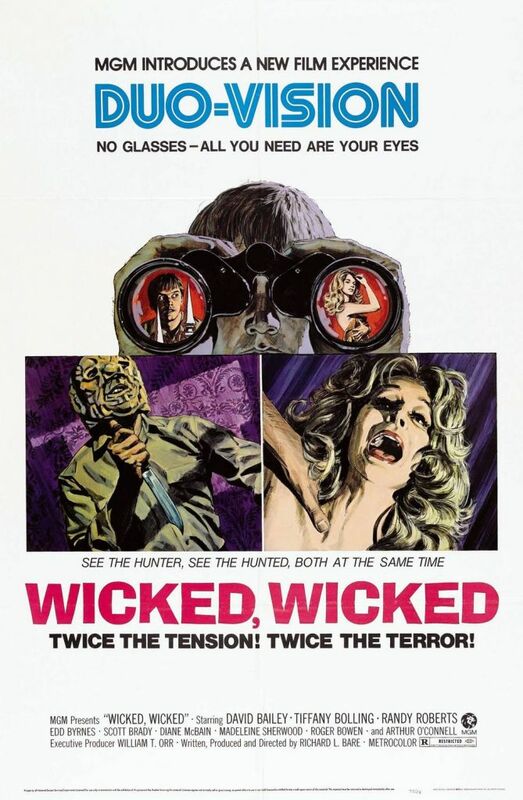 Filmed in a split-screen format called Duo-Vision used for most, but not all, of the film’s runtime, the audience is ostensibly treated to both the killer’s and the victims’ point of view simultaneously. Fortunately for us, though unfortunate for Wicked, Wicked’s Oscar chances, this split screen turns what would be a relatively tepid slasher film into a camp classic, one that became one of the biggest hits on TCM’s Underground series in the late 2000s. Not content to just hire extras at scale and have the creepy mask-wearin’ Jason off them one by one, Wicked complicates matters by introducing an economic element to the mix, as the manager of this glorious old seaside hotel decides that the missing women were actually just skipping out on their bills. Hotel detective Rick Stewart (David Bailey), however, discovers the women may have left the resort, but they never returned home, implying more than simple skipping out is going on. Soon, Rick’s beautiful ex arrives, an up-and-coming singer named Lisa James (Tiffany Bolling) set to perform at the hotel. Her superstar image includes wearing a large and unconvincing blonde wig, which unwittingly makes her the killer’s next target. Filmed in and near the legendary Hotel del Coronado, the setting of Wicked, Wicked is one of the best features of the film. Though the hotel was purportedly being expanded and renovated in the early 1970s, only the shabbier areas are shown, especially in the case of the back passageways, and the rooms of one Lenore Karadyne (a terrific Madeleine Sherwood), an aging former film queen spending her last days in a suite in what used to be a grand and fabulous hotel. “Karadyne” is, by the way, pronounced “Carradine,” for reasons that I’m sure are obvious. Wicked, Wicked is a bizarre, kitschy little horror flick that somehow out-De Palma-ed De Palma before he really became Brian De Palma. Wicked spoofs The Phantom of the Opera by turning the opera ingenue into a lounge-funk singer, features a decidedly Hitchcockian style, and uses a split screen technique; De Palma, a year later, would spoof The Phantom of the Opera with his Phantom of the Paradise, using what would become his trademark Hitchcockian homage and the occasional split screen as well. No one seems to have drawn any kind of tangible parallel between these two films; split screen wasn’t exactly new — see Napoleon (1927) and Pillow Talk (1959) — and De Palma had been shopping around a rock parody of Phantom years before Wicked, Wicked was released. Yet the similarities are uncanny enough that it’s easy for the mind to slip into thinking that Wicked was a rip-off of Phantom of the Paradise. It wasn’t, of course, but watch it and just try to convince yourself otherwise. Still, the differences are striking, primarily in the musical themes. In in De Palma’s film, the themes become almost an excoriation of glam rock which, as Film Freak Central rightly points out, gets a little scold-y at times. Wicked, meanwhile, tends to play on one level as an homage to silents, including the use of one of the screens to establish an adorable little old lady playing the original organ score for the 1925 Phantom of the Opera. An archival copy of the same sheet music seen in the film can be found here in PDF, if you’re interested, and of course you are. But Wicked is also classic 1973, and one last and loving look at that bizarre, bland bit of American culture that existed after the 1960s ended and before the 1970s began, a time when low-impact almost-funk was considered entertainment and not something played in elevators just to keep you distracted from that mild case of motion sickness when the car stops. It’s a movie made during that yawn-filled period from roughly the day after the Stones played at Altamont to the day “Crocodile Rock” reached #1 on the Billboard charts, an era that the producers of Wicked obviously loved every boring, mediocre minute of. In fact, lead actor David Bailey was chosen in part because of his cultural cachet in the early 1970s, having starred in commercials that became pop hits. “Bailey is familiar to television audiences as the bare-chested man in Mitchum deodorant spots,” the MGM press for Wicked, Wicked cheerfully reported, along with two full pages of Bailey in a PR-spun interview talking about pretty much nothing else but his own chest. There should always be a place for the low-budget hotel movie, where the same six extras as guests continually crisscross the lobby and enjoy the show in the supper club, and where everything, from room service on up, has the attractively casual air of making do with the needs and opportunities of the moment. It’s Duo-Vision we have to thank for the almost immediate reveal that the handyman is the murderer. The intention seems to have been to show both the killer and the victim at the same time and, taking that idea perhaps a bit too literally, Wicked, Wicked identified the killer fully from almost the very first frames, thus leaving the only reveal the why, since the who, what, when and where were already answered. There was apparently a slight attempt to make Edd Burns, still still angry over being typecast as Kookie in “77 Sunset Strip,” a red herring character, and he really gives the psycho hotel employee role his all, but it’s still clear early on that he isn’t the killer. It’s not a bad conceit, especially during the scenes with crimes on one screen and Jason’s troubling childhood flashbacks on another, though it can be a bit heavy-handed. The restoration is impressive as far as clarity goes; those of you who have seen this on TCM will be pleased at the new print. It does seem that there are some issues with color and tone that don’t appear in the TCM print (or at least the TCM print that used to show on Underground a few years ago). Robert Nichols has a rather disturbing orange glow in his first scenes, for example, and some of the deteriorated film with blue and pink tones doesn’t look quite right. The objects in the film look better in these segments than the people do, while the overall frame is actually a little pinker (or bluer) than in the older print. For the majority of the film, there is no problem with the color shift, and those scenes look great. The performances are uniformly competent and of the made-for-TV movie variety, though Randolph Roberts as our mistreated young handyman puts in a very good turn in what was his first film role. The next big role he landed was a year later… as the still-missing Chuck Cunningham #2 on “Happy Days.” Tiffany Bolling may have been given some silly wigs and dull songs to sing, but she does well with what she has. Character greats Scott Brady, Roger Bowen and Robert Nichols round out the cast. Wicked, Wicked is out on MOD DVD from Warner Archive in a restored print, and also comes with the theatrical trailer. Though the film looks better than you’ve seen it before — my understanding is that the restoration took nearly three years to complete — the film elements were obviously in bad shape, as there is still some fading to pink and/or blue throughout. The audio is terrific and when the original source elements of the video were in good shape, they look bright and clear. You’re really not going to get a better copy of the film anywhere else — and make sure you have a nice big screen to watch it on! From Celluloid Activist. Formatting mine. Interesting that you didn’t mention Richard L. Bare, whose idea this crazy movie was. Bare came to this just after completing the run of GREEN ACRES, where he’d directed all but the first few shows. Before that he’d spent many year at Warner Bros TV, where he’d done many episodes, including more than a few 77 Sunset Strips. Believe it or not, I actually saw WICKED, WICKED in a theater! The Beverly, 95th Street at Ashland Avenue. It’s not a movie house any more; the building is still there, but it’s now a Baptist church (insert your own joke here). Not much I can say about the movie itself; it was a Saturday afternoon, I had nothing better to do, etc. Not bad, not good, a time-killer. Do you know the story of David Bailey, post this pic? Some time in the 2000s (can’t recall exactly), there was a daytime soap called Passions, possibly the weirdest show of its type ever (and yes, I do remember the original Dark Shadows). David Bailey, who had just turned 70, had the part of Evil Rich Guy Alistair Crane, which he played to the hilt and beyond. Passions’s producers decided to give their cast and crew an end of the year break; they had marathon tapings, so there would be episodes taking the stories from Thanksgiving through the New Year. On Thanksgiving Day, David Bailey suffered a fatal heart attack while swimming in his pool. His character, Alistair Crane, figured so heavily in the storylines that it was impractical to edit or reshoot, so NBC swallowed hard and aired the episodes as taped. On the show, Alistair was poisoned by person or persons unknown; for a few weeks he was in a coma, shown in the hospital all tubed up. Alistair slowly recovered, and became more ferocious than ever, vowing vengeance on those who’d poisoned him. Ultimately, he was up and around, shouting “Nobody’s going to kill me!” and variations thereof. All of this aired after David Bailey’s death, well into the new year. When Passions resumed production, the part of Alistair was recast, and the stories went ahead without a break. I don’t know if there’s a lesson in this, and I also know that it’s sort of irrelevant to the basic post, but I just thought I’d pass it on (so to speak). Wow, amazing info about David Bailey. I only knew about Bailey because I was, when he died, an active member of alt.obituaries on Usenet and it was one of those strange deaths that caught my eye. But I didn’t recognize him in WW, not even when I saw his name, until I looked him up afterwards, and I definitely didn’t know the details. In fact, I’m not sure I knew it was a heart attack; my memory is that we didn’t know why he had drowned until several days after his death was reported. There wasn’t any intended oversight about Bare, by the way, I just had so much other info I didn’t get around to him specifically. That said, my original notes on this article include the words SO YOU WANT TO BE A GLADIATOR, so. Should have at least mentioned that he’s still with us at 101 years young!